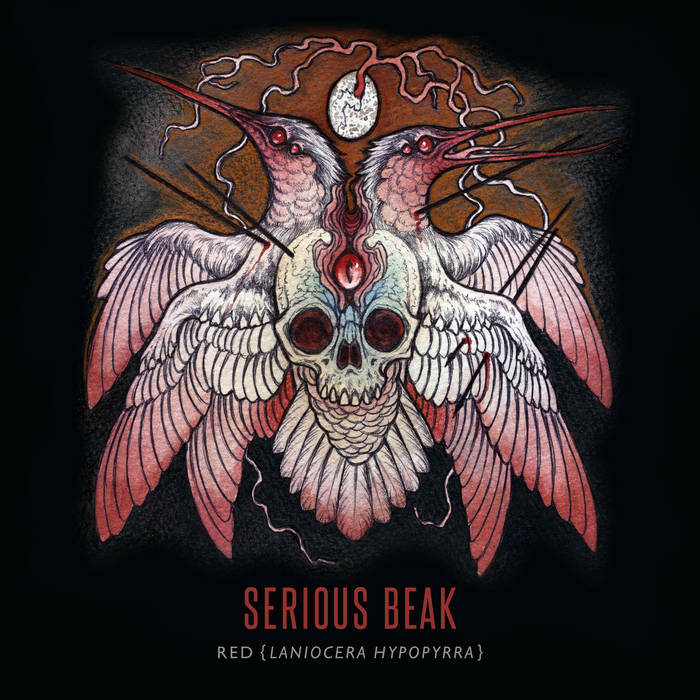 After their wildly acclaimed debut album “Huxwhukw” back in 2011, we didn’t hear much from Australia’s psychedelic progressive band Serious Beak. I was much delighted when they announced a sophomore album under the name of Ankaa and released a single for it, “Red (Laniocera hypopyrra)”. First of all, “Ankaa”, from my best suppositions, comes from the Arabic العنقاء, al-ʿanqā’, which means “the phoenix”. Now, a Phoenix is a mythological bird related to the sun, and that lives cyclically. Ankaa is also a star, otherwise known as α Phoenicis, a rather common binary star that will most probably end its life as a white dwarf. Now, the two sides of the name, Ankaa, are carried throughout the song titled, too; each one has a star side, and a bird side. The star side is a stage of the life of a star or, for the last song, the universe, and the bird side is written with the scientific name of species. So on one side we’ve got Proto[-star], Main Sequence, Red [Giant], and Heat Death, while on the other we’ve got Menura novaehollandiae, Dacelo novaeguineae, Laniocera hypopyrra, and Teratornithidae. Let’s go through these one by one and try to find elements that support the concept. Proto (Menura novaehollandiae) is a short and “noisy” opener. Like the stellar stage, it sounds unfinished, incomplete, and contains hints of what the rest of the album will sound like. Like the bird – the Superb lyrebird – it copies other sounds to form its own singing; it integrates, just like many overtures, motives and passages found later in the piece in itself. It’s also a bird species endemic to Australia, just like the next one. Main Sequence (Dacelo novaeguineae) is the biggest chunk of the album, at 13 minutes long. It’s rather tranquil, contemplative at first, but slowly gets kicking and more energetic, pretty much like the “adult” stage of a star. The avian side of this one is trickier for me, as I’m pretty much unfamiliar with Australian wildlife. Dacelo novaeguineae is the Laughing kookaburra, another species native to the country. The connection might then be the late and short guitar solo in the song, not only referring to the bird’s peculiar song, but also the fact that it’s most often heard after sunset. There’s also recordings of the bird’s call at the very end of the song. And as the bird is in the Halcyonidae family, this might be a reference to fellow Aussie Plini as he was formerly known as Halcyon. Then comes the single Red (Laniocera hypopyrra). It expresses one of the most violent stage in a star’s life, and is also the most energetic song off the album. It’s the second longest song, at a little more than 10 minutes in length. As for the bird, the Cinereous mourner, native to Central and South America, its appearance here might be due to two things: either its ashy grey colour representing the ashes from which the conceptual Phoenix, Ankaa will rise, or the colour of the bird’s nestlings: orange. Orange, like the star on which this record might be based off: it is classified as an orange giant. Finally, Heat Death (Teratornithidae) is the closure of the album, but is longer than Proto, at 7 minutes and a half. It’s the most calm piece of them all, atmospheric and soothing. For this one, we’re moving out of α Phoenicis to get a much, much broader focus: the whole universe. Heat death is a theory about the ultimate fate of the universe where it basically freezes to death in a state of maximum entropy on incomprehensible lengths of time. I don’t know why the star, the Phoenix, Ankaa was forgotten for the album’s ending however. I’m also clueless as to what the connection with the bird group presented is. Teratorns are an extinct group of large prey birds from the Americas. It might has to do with their extinct status, thus reflecting the heat death status of the universe. It’s the only thing I can come up with. The song itself expresses a slow, nostalgic but not remorseful death. Death in all its beauty. So, what happens with our principal “character”, Ankaa? We cycle through its life, from birth to death, and are left at that? Not really. As the Phoenix shall rise from its ashes, you shall put Ankaa on repeat eternally.